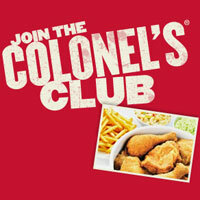 KFC Coupon - Join the Colonel's Club for Exclusive Offers and Deals Delivered to your inbox! It all started with one cook who created a soon-to-be world famous recipe more than 70 years ago, a list of secret herbs and spices scratched out on the back of the door to his kitchen. That cook was Colonel Harland Sanders of course, and now KFC is the world's most popular chicken restaurant chain, specializing in that same Original Recipe. Sign up with your email address to receive weekly exclusive offers.